Life crises threaten our spiritual stability. Losing a loved one—whether or not you expect their death—is always traumatic. The trauma of adjusting to the new identity of widow while facing a multitude of questions and urgent decisions can be overwhelming. In this book of 60 meditations, Nell Noonan candidly shares her experiences in the 26 months after the death of her husband. She describes her journey in grief as packed with blessings and brokenness. Despite the low points, she managed to find God in the midst of bereavement. Noonan acknowledges that each person's grief journey is unique. "My writing is not meant to tell you what or how or when to do anything," Noonan says. "The devotions are only meant to hold your hand and feel your pain so that hopefully you will be able to inch slowly, step-by-step, into being more whole, less broken—into a new, peace-filled life." 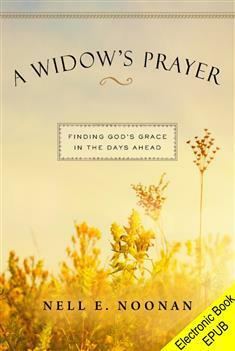 This book will help widows, whether they choose to read it alone or with a group. A good resource for grief support groups, and an appropriate gift to show your concern for any woman grieving the loss of her husband.